The entry exhibit hall presents a broad sweep of Jewish history and Jewish tradition. It includes Torah scrolls, kiddush cups, and other artifacts. In this hall, as in others, the number of actual artifacts is lower than might be seen in more established museums, but the void created by their absence is filled in part by attractive, eye-catching custom paintings and multi-media presentations. Subsequent halls deal with Jewish history, including shtetl life, pogroms, the Jewish intellectual and cultural role in Ukraine, the prominence of Ukrainian Jews in the Zionist movement and in modern Israel, the Holocaust in Ukraine and elsewhere (including righteous Ukrainians who saved Jews), and postwar Ukrainian Jewish life. As might be expected, the history of Jewish life in Dnipropetrovsk is covered in some detail. The three exhibits depicted on this page show how the Museum has used multimedia to illustrate Jewish life in Ukraine and Europe. 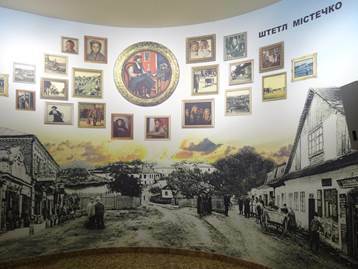 The top mural shows shtetl life through a combination of photos and paintings. In another display, visitors may have their photo taken in a shtetl scene. 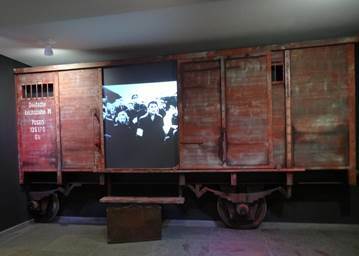 The railroad car represents the transport of Jews to death camps during the Holocaust. Although its inclusion might be expected in a museum of this type in the West, it is somewhat unusual in Ukraine because Holocaust victims there were not transported by train to death camps; they were force-marched to ravines or other pits and shot. The photo is of Jews being rounded up for transport elsewhere in Europe. 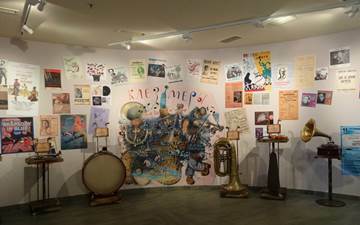 The display at left shows the contri-bution of Ukrainian Jewish musicians to Ukrainian and international musical life. Playbills and posters on the wall remind viewers of specific individuals, such as violinists David Oistrakh and Leonid Kogan, the latter a native of Dnipropetrovsk. The center wall section focuses on klezmer music. The musical instruments and phono-graph obviously are vintage objects. The museum will undergo a process of continuing renewal, said Dr. Schupak. Additional interactive displays will be installed, more artifacts will be found and presented, and entire new exhibits will be opened. Traveling exhibits are sought and shown. Space also exists for local art. Planners of the Museum are very conscious that it is a Jewish museum on Ukrainian land. Its perspective is Ukrainian, said Dr. Schupak; it must be sensitive to Ukrainian history. However, Dr. Schupak continued, the museum has no "blank chapters." It covers the Khmelnytsky pogroms (in 1648), other pogroms in Ukrainian history, collectivization, the Holodmor, and the Soviet terror. The role of Jews as both victims and perpetrators of certain Soviet crimes is acknowledged. Most displays are labeled in Ukrainian; a second language, English, will be added to the captions, said Dr. Schupak. Russian, Polish, and Hebrew will follow, he added. In addition to building and maintaining the museum, Dr. Schupak stated several additional Tkumah program objectives. The organization will continue to pursue Holocaust research in Dnipropetrovsk and elsewhere in Ukraine, he said. As always, it will collaborate with Yad Vashem and Holocaust research organizations in other countries. It also engages in various educational endeavors, including publications about the Holocaust for different age groups, creating traveling exhibits, curriculum development, teacher training, and organizing seminars and conferences for high school students and others. On a local level, it organizes Holocaust study clubs for intellectuals and a very popular "Sunday University" program that offers popular lectures on Jewish history, Islam in the modern world, Judaism and Christianity, and other topics. The Sunday University lectures often attract as many 300 people, Mr. Schupak stated. Tkumah also is active in interethnic relations, meeting with various groups in an effort to promote harmony between people of different religions and ethnic backgrounds. One of the museums with which he is in regular contact, said Mr. Schupak, is the Cossack Museum in nearby Zaporizhyzhya. Responding to a question about financial support, Dr. Schupak said that Hennady Boholubov and Ihor Kolomoisky supported almost all construction and development costs of the Museum. Several other local oligarchs made designated gifts, he averred. For now, Dr. Schupak continued, Mr. Boholubov and Mr. Kolomoisky are paying annual expenses, but their long-term support of the Museum and associated office costs is not assured. Further discussions with the Philanthropic Board of the Chabad community are necessary, said Dr. Schupak. In the meantime, Tkumah is applying to several foundations for grants in support of designated projects, such as publications. Dr. Schupak noted that Tkumah is not fully staffed in its research department or in specialized areas of museum management and display. 37. Hesed Menachem, the Joint Distribution Committee welfare center in Dnipropetrovsk, occupies a large, former preschool building in a central location. At the time of the writer's visit to the city, debate was continuing within JDC about a proposed move of the hesed to space designated for it in the Menorah Center. Those in favor of the move cited the inconvenient design and increasingly decrepit condition of the current building; among the design flaws is the basic two-story structure of the facility, which is difficult for many elderly people to navigate. Renovations, they said, would be prohibitively expensive. Further, it is only proper that elderly Jews be located in the center of Jewish community life, with full access to all Menorah Center programs and events. Those who are opposed to the move note that, unlike the Menorah Center, the current location has a yard, which has become an important site for warm-weather activities, especially the traditional celebration of World War II Victory Day in May. The allotted space in the Menorah Center is smaller in total area and much more compact than that of the current hesed, so it is likely that clients will feel confined and that the hesed will lack storage space. Parking space at the Menorah Center is very limited, they continued, so client access to hesed vans will be much more difficult. Hesed Menachem currently serves 7,000 elderly clients, stated hesed director Anatoly Pleskachevsky. The number is declining from year to year, he said, due to deaths and to new restrictions that tighten eligibility standards for new clients. The hesed currently has 26 categories of assistance based on the client's health, his or her family situation (that is, whether a family member can/will extend assistance), and living situation (alone or with relatives, condition of apartment, etc.). 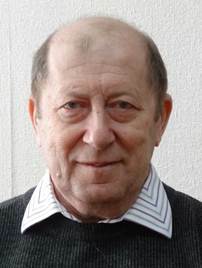 Only 70 clients, Mr. Pleskachevsky continued, are Holocaust victims eligible for support from the Conference on Jewish Material Claims against Germany. Hesed director Anatoly Pleskachevsky is a 34-year veteran of the Soviet armed forces, having retired as a colonel after serving in the artillery corps in Afghanistan. Clients are comfortable in the current hesed building, he said, because it is familiar to them and all necessary services are readily accessible. However, he thinks that the hesed should be relocated in the Menorah Center so that the elderly are included in the community gathering place. Between 4,500 and 5,000 clients receive smart cards (discount cards) that can be used in a specific chain of grocery stores, and a smaller number receive discount cards accepted by a chain of pharmacies. Further, JDC has encouraged certain stores to sponsor holiday promotions for all elderly in the city. Nonetheless, said Mr. Pleskachevsky, many people are living in conditions of substantial economic distress. Grocery prices are rising much more rapidly than are incomes, including pensions. Fortunately, he continued, the local Chabad community also offers important welfare assistance, including the distribution of food parcels to Jewish elderly twice yearly, a hip replacement and rehabilitation program (which reduces the number of Jewish elderly who are homebound), and the Jewish Medical Center, which specializes in geriatric care. The hesed has a client-care contract with the JMC, Mr. Pleskachevsky said. The hesed also coordinates service provision with municipal social service agencies, noted Mr. Pleskachevsky. 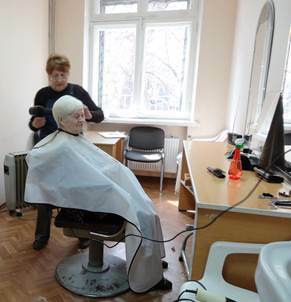 Hesed Menachem offers a number of services to its clients, including hairdressing. 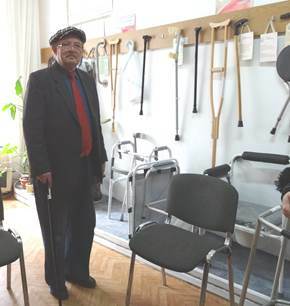 The man in the photo at right is standing in a small room at the hesed that dispenses various healthcare implements to clients, including wheelchairs, walkers, and orthopedic mattresses. He is brandishing a new cane, which, he informs the writer, is the best in the city. Pointing out the hesed identification label on the cane, he said that the cane does not need a label because only the hesed has such high-quality canes in its inventory; everyone knows that it is a hesed cane. A veteran of World War II, the client is wearing a belt with an Army buckle; his bifocal glasses are thick and crudely made. The opening months of the museum were marred somewhat by a vanity display of clocks and other items from the collection of a major donor. See footnote 13, page 5. Tkumah consulted with several such organizations in developing the Museum. Zaporizhyzhya is the home territory of a large Cossack group that has reached out to Jews in the region.